There is a large body of opinion that excess saving – or more precisely, an increase in the global propensity to save relative to the propensity to invest – has lowered global equilibrium real interest rates in the past 25 years. While economists dispute the extent of the decline, few now question that a decline has taken place or that excess saving has played a causal role. Bernanke (2005) was among the first to suggest that an emerging-world ‘savings glut’ was responsible for the decline in real long-term government bond yields witnessed in developed economies from the late 1980s onwards. Figure 1 plots 10-year real, ex ante government bond yields for the US, Japan, the UK and a Eurozone composite from 1975 onwards, documenting the extent to which long-term expectations of future real interest rates have declined. Notes: The figure plots data on 10-year (constant maturity) inflation-linked government bond yields where available, extending the series using the estimated relation between real, ex ante bond yields and variables that are available over longer durations. In the years since the 2007-08 Global Crisis, short- and long-term real interest rates have fallen further, and the idea that excess saving has resulted in a secular decline in interest rates has become more widespread. Summers (2014a, 2014b) has argued that the global economy has entered a period of secular stagnation, in which too much saving is chasing too few investment opportunities, driving the equilibrium real interest rate below zero and curtailing the effectiveness of monetary policy in the process. 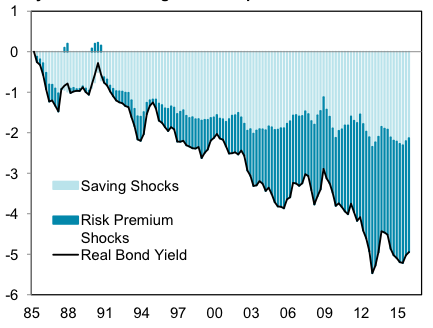 Although there are differences between the savings glut and secular stagnation theses, a common implication of both is that excess saving has resulted in a generalised decline in yields across all assets, including but not restricted to real government bond yields (sometimes referred to as real ‘risk-free’ rates). Yet, in the years before and since the 2007-08 crisis, the global economy has also been characterised by rising yields on quoted equity, a feature for which the standard excess saving story cannot easily account. 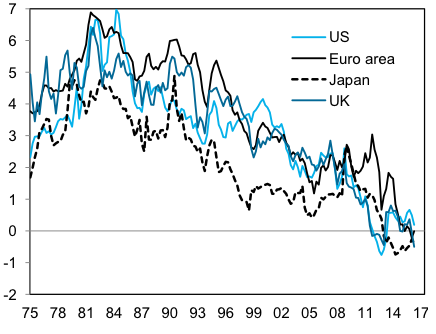 Figure 2 plots a weighted average of G4 (US, Eurozone, Japan and UK) 10-year real ex ante government bond yields and the earnings yields on global equities adjusted for changes in leverage from 1975 onwards. Notes: The real bond yield series uses data for the G-4 only, as this provides the closest approximation to the ‘risk-free’ real rate for global investors. For the equity yield series, data for developed and emerging markets are both included. In a recent paper, I argue that the excess saving story is incomplete because it fails to account for the rise in the earnings yield on quoted equity from the early 2000s onwards (Daly 2016). A separate explanation – which is complementary to the excess saving story – is that there has been a secular increase in the global ex ante equity risk premium since the turn of the century, which has simultaneously pushed risk-free yield curves lower and earnings yields on risky equities higher. The implication is that global equilibrium (risk-free) interest rates have fallen not only because there has been an increase in the global propensity to save relative to the propensity to invest, but also because a rise in the global risk premium has increased the wedge between risk-free rates and the real required return on risky investments. To explore the relative importance of ‘saving’ and ‘risk premium’ shocks in driving long-term risk-free rates lower, I apply a sign restrictions approach in which the two types of shocks are identified by whether global real bond and equity yields move together (savings shocks) or move apart (risk premium shocks).1 On this basis, I find that most of the 2 percentage point (pp) decline in G4 real bond yields that took place between 1985 and 2000 was due to an increase in the global propensity to save relative to the propensity to invest. However, between 2000 and the start of 2016, when G4 real bond yields declined by a further 3pp, I find that only 0.5pp of the decline was due to excess savings shocks, while 2.5pp resulted from a rise in the global equity risk premium. What has driven the rise in the global risk premium since the turn of the century? One explanation is that the increasing importance of risk-averse investors in China and other emerging economies has accounted for both an increase in global ex ante saving and a rise in the global equity risk premium. The suggestion is that there is some connection between higher saving rates in emerging markets and high levels of risk aversion. This connection, which exists in many theoretical models of consumer behaviour, could explain both low bond yields and high yields on risky capital. Another explanation (which does not exclude the first) is that it reflects the impact of population ageing and pensions’ regulation on saving behaviour in advanced economies. There has been an increased focus on the long-term sustainability of private and public pension provision in advanced economies since the turn of the century, and a common response to these concerns has been to alter the tax treatment of pensions to encourage increased saving for retirement. At the same time, regulations affecting private pensions saving in advanced economies have tended to skew the investment of those savings away from equity and towards fixed income. Both explanations suggest that, in effect, the marginal investor has become more risk-averse and the savings glut went hand in hand with a rise in the ex ante global equity risk premium. It is for this reason that I view the excess saving and rising risk premium narratives as complementary. An alternative explanation for the divergence between global bond and equity yields and the implied rise in the global equity risk premium is that it reflects a reduction in expected long-run global growth. However, it is difficult to reconcile this explanation with the timing of the increase in the ex ante global equity risk premium (which began at the turn of the century). Moreover, given that the rate at which future earnings are discounted has also fallen during this period, the change in growth expectations would need to have been exceptionally large for this to be the primary explanation for the rise in equity yields.2 Thus, while reduced growth expectations may have played some role in the rise in equity yields (and the associated increase in the equity risk premium), it seems unlikely to have played the leading role. Bernanke, B (2005), “The Global Saving Glut and the U.S. Current Account Deficit ”, Sandridge Lecture, Virginia Association of Economics, Richmond, Virginia, Federal Reserve Board, March 2005. Daly, K (2016), “A Secular Increase in the Equity Risk Premium ”, International Finance, 19: 179–200. Summers, L (2014) “US Economic Prospects Secular Stagnation, Hysteresis, and the Zero Lower Bound”, speech delivered to the National Association of Business Economics ’ Economic Policy Conference, 24 February, 2014. Summers, L (2014) “Reflections on the New Secular Stagnation Hypothesis ”, in Secular Stagnation: Facts, Causes and Cures, CEPR Press. The identification strategy assumes than an increase in the global propensity to save relative to the propensity to invest will result in a simultaneous decline in both real bond yields and equity earnings yields, whereas an increase in global risk premium will result in a decline in real bond yields but a rise in equity earnings yields. See Daly (2016) for more details. In standard equity valuation models, future earnings are discounted at the real risk-free rate. 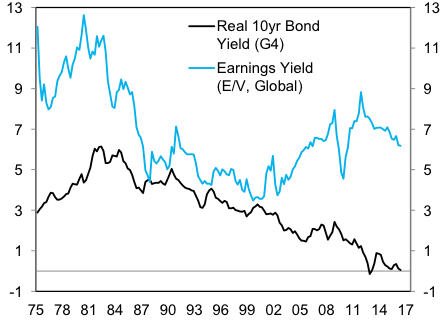 Given that real bond yields have fallen by 3pp since the turn of the century, this implies that the expected long-run annual growth rate of earnings would have to have fallen by 3pp over this period just to offset the effect of declining bond yields, and that expected growth would have had to have fallen by a further 3pp (6pp in total) to have accounted for the rise in equity yields that has actually taken place. These are large numbers and there is little evidence from surveys that growth expectations have fallen to anything like this degree.